This is my second tube of Hada Labo UV Creamy Gel SPF50 and it's already half empty. I consume sun protection in large amounts, so it's not really a surprise, but I have to say that this particular one is my favorite. Until the next thing comes along, at least. It's the texture, more than anything else. An SPF 50 in a runny liquid form that sinks into the skin and feels cool and gel-like. At first the skin appears a bit tacky, just like after using an Asian toner, so I give it a few minutes before proceeding with my makeup. The Creamy Gel eventually disappears completely, and unlike most SPF products I've used, so far it has never clashed with any primer or foundation I've paired with it. That's a rarity even among cosmetically-elegant sun blocks that always seem to have at least one product that causes them to ball underneath. The ingredient list (see below) doesn't hint how great it is. In fact, I wasn't convinced before trying it, thinking it was going to be too silicone-like, but Hada Labo UV Creamy Gel seems to be kinder to my skin than many other sunscreens. If I'm reading it right, this is a combination of chemical and physical protection (pretty low on the physical, though). There's no white residue and it doesn't disturb the balance (so neither dryness nor extra oil production seem to occur). You have to like the wet feeling and surface it creates upon application, and I do. I'm guessing it's the hyaluronic acid that makes it feel so good. The silicone content means that another 'cone-based primer is not really necessary. I've tried it both ways, and found that I still like my radiance primers afterwards, but minimalism has never been my thing, so your mileage is likely to vary. All I can say is that I've left the Elta MD one to the husband (I've gone through several bottles of it last year) and haven't looked back. 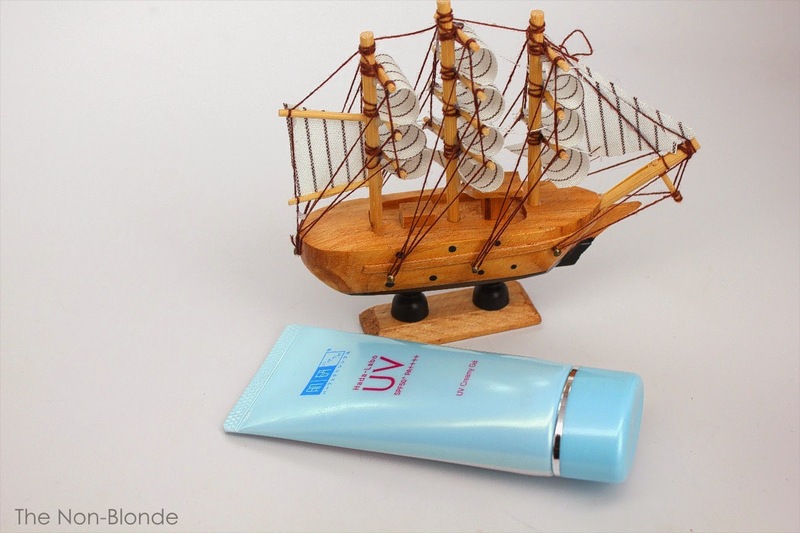 Ingredients: Water, Ethylhexyl Methoxycinnamate, Butylene Glycol, Isononyl Isononanoate, Alcohol, Dimethicone, PEF-12 Dimethicone, Polysilicone-15, Glycol Dimethacrylate Crosspolymer, Bis-ethylhexyloxyphenol Methoxyphenyl Triazine, Sodium Acetate Hyaluronate, Sodium Hyaluronate, Hydrolized Hyaluronic Acid, Diethylamino Hydroxybenzoyl Hexyl Benzoate, Polysilicone-13, Ammonium Acryloyldimethyltaurate/VP Copolymer, Polystyrene, Polyvinyl Alcohol, Acrylates/C10-30 Alkyl Acrylate Crosspolymer, Triethanol Amine, Titanium Dioxide, Silica, Hydrogen Dimethicone, Aluminum Hydroxide, Methylparaben, Propylparaben. Hada Labo UV Creamy Gel SPF50 PA++++ can be found for around $13 on Amazon, and in most Asian markets/grocery stores. Yes! This is a "holy grail" product for me, especially in the summer. In general, I rotate between this and EltaMD because I have pretty dry skin, but the Hada Labo is so cosmetically elegant. And a fair price. It replaced my former favorite, Shiseido Urban Environment. If anyone has tried and liked the Shiseido, definitely give this one a try. This sounds ideal! And love the price. Off to order some. It looks like TiO2 is included for reasons other than sun protection, it is way too low to have any contribution to SPF or reliable UVA blocking. I'd classify it as a pure chemical filter system. UVA protection is provided by Tinosorb S and Uvinil A Plus. This is my holy grail sunscreen too! Comfortable, no white cast, relatively good price, works with primers and foundations.